Welcome to my website. My Name is Eddie Rudak, I am principal private Piano Teacher at Piano Lessons Derby. Piano Teacher – Eddie Rudak. I teach Piano students of all ages and abilities, helping beginners learn to play the Piano through the music they like most. I have been teaching Piano for over 35 years to both adults and children. Alongside my Piano teaching career, I have also worked extensively as a professional Musician. I have played Piano in prestigious Hotels as well as working as Musical Director with many well established Bands and recording Artistes. I have also participated in Music festivals throughout the UK and Europe. Classical Piano music or contemporary Piano music, the choice is yours! In my capacity as a Music Teacher, I encourage my students to enjoy music as they learn. I pride myself on my patient, friendly, relaxed approach to teaching. From your first lesson, I aim to put you at your ease. Learning should always be fun, never a chore. For more experienced students, I have a course of advanced Piano lessons that will really help you to develop your technical skills, and teach you how to best interpret the great classics, taking your playing and performance skills to next level. We also offer Private Keyboard Lessons too! – Click here to learn more..
Here’s what has been said about me..
Ed has been teaching me to play Piano for 3 months, I am delighted with my progress to date. Everything is explained clearly in a way that i can understand. Ed has been teaching me to play Piano for 3 months, I am delighted with my progress to date. Everything is explained clearly in a way that i can understand. Highly recommended! Paul Grundle, Derby. My son has had Ed teaching him now for well over a year. He has always been very professional and courteous. I have had to change my sons lessons on a number of occasions and he has always done everything he can to accommodate our situation. More than that, when I went through a particularly difficult time financially some months back he went above and beyond to ensure that my son didn't have to give up has piano lessons. He is not only a fantastic teacher to my son but has also become a good friend and I would HIGHLY recommend him to anyone considering piano lessons. Thanks Ed you have inspired my son like no other teacher before! Lynette Shaw - Breadsall, Derby. My son has had Ed teaching him now for well over a year. He has always been very professional and courteous. I have had to change my sons lessons on a number of occasions and he has always done everything he can to accommodate our situation. More than that, when I went through a particularly difficult time financially some months back he went above and beyond to ensure that my son didn't have to give up has piano lessons. 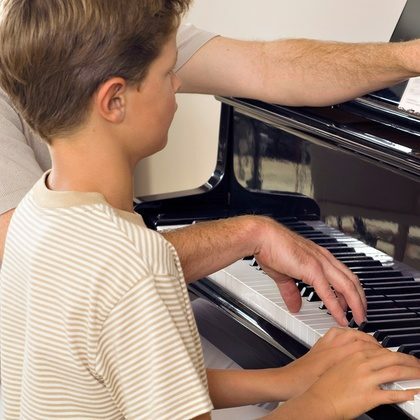 He is not only a fantastic teacher to my son but has also become a good friend and I would HIGHLY recommend him to anyone considering piano lessons. Thanks Ed you have inspired my son like no other teacher before! Lynette Shaw - Breadsall, Derby. I've been having piano lessons with Ed for about 3 months now. What an amazing teacher he is, every lesson is well structured and challenging and set at a pace that suits me perfectly. Ed gives fantastic support, is always enthusiastic and the lessons are consistently enjoyable. He's always willing to answer any questions at any point throughout the week. As a beginner, I have progressed enormously in the last few months with Ed's help at all aspects of playing the piano. I am so very glad to have him as my Piano teacher. Thank you Ed. I've been having piano lessons with Ed for about 3 months now. What an amazing teacher he is, every lesson is well structured and challenging and set at a pace that suits me perfectly. Ed gives fantastic support, is always enthusiastic and the lessons are consistently enjoyable. He's always willing to answer any questions at any point throughout the week. As a beginner, I have progressed enormously in the last few months with Ed's help at all aspects of playing the piano. I am so very glad to have him as my Piano teacher. Thank you Ed. Chris Brough. Spondon, Derby. Eddie is a super piano teacher. He's a cheery man who inspires his young pupils to be the best they can be. My daughter loves her weekly piano lessons and i'm delighted with her progress after only a few weeks. Thank you Eddie. Eddie is a super piano teacher. He's a cheery man who inspires his young pupils to be the best they can be. My daughter loves her weekly piano lessons and i'm delighted with her progress after only a few weeks. Thank you Eddie. Jane Burrows. Allestree, Derby. I am returning to piano lessons after over 25 years. Ed tailors my lessons to my level of ability. I feel I am getting a good education and without pressure to sit exams . I can request the genre of music I like (if I’m feeling precious !) and most importantly we have a laugh. I didn’t look elsewhere for lessons- it’s so convenient that Ed comes to the house - and I have no complaints. I am returning to piano lessons after over 25 years. Ed tailors my lessons to my level of ability. I feel I am getting a good education and without pressure to sit exams . I can request the genre of music I like (if I’m feeling precious !) and most importantly we have a laugh. I didn’t look elsewhere for lessons- it’s so convenient that Ed comes to the house - and I have no complaints. Laura C. Barr. Derby. I Would Have No Hesitation Recommending Him! I have piano lessons with Eddie on and off since 2013. Not only is he a great and professional teacher but an enormously cheerful man who is great to work with. I would have no hesitation recommending him. I have piano lessons with Eddie on and off since 2013. Not only is he a great and professional teacher but an enormously cheerful man who is great to work with. I would have no hesitation recommending him. Richard Brown - Alvaston. Fabulous piano teacher. He has been teaching my daughter piano for over two years and my daughter has made excellent progress. He is a professional, kind and highly skilled individual, who will get the best out of your child. He also does not put up with any nonsense and demands that his students put effort into this instrument. Highly recommend him as a Piano teacher! Mrs. Heidi Lee. Littleover, Derby. Ed has been teaching my 6 year old son for just under a year now, he has a wonderful approach with children and has made him feel at ease and eager to learn from day one. My son loves his piano lessons and always looks forward to the next because Ed makes learning the piano fun!! Highly satisfied & would definitely recommend Thanks Ed, Ms. Laura Jackson. Derby Central. I decided to take lessons in my retirement fulfilling a lifelong wish. Eddie has such a deep professional understanding of individual needs and is helping me fulfil my dream. I am really encouraged and I am progressing slowly but surely. Thank you Ed for your continuing patience and support. Mrs. Pauline Harris. Allestree, Derby. Eddie Is Approachable, Fun, and Fair! Eddie has been teaching my son piano now for two years and the considerable progress my son has made since we changed teachers has been fantastic! He is approachable, fun and fair. I have made several recommendations to friends for their children. Mrs. Katie Tildesley, Chellaston. Derby. Eddie has been teaching my son piano now for two years and the considerable progress my son has made since we changed teachers has been fantastic! He is approachable, fun and fair. I have made several recommendations to friends for their children. Mrs. Katie Tildesley, Chellaston. Derby. Buying a New or used Piano? I would personally recommend Clement Pianos in Nottingham. They are a well established and respected family run business. Clement’s staff will give you good advice about which Piano will best suit your needs, within your price range. Clement’s stock leading brands of both acoustic and digital Pianos. Yamaha, Kawai & Roland being the most popular. Take a look at their website for more detailed information. You might even pick up an absolute bargain on Gumtree, – Click here to take a look. Call to book your trial Piano lessons! Private Piano Tuition in Derby since 1979.